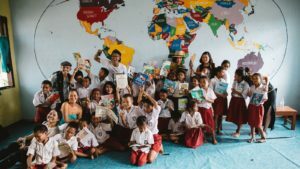 Remember the “We Give Books” campaign in collaboration with the “Books for Asia” program from The Asia Foundation and the Pearson Publishing that we held a while ago? (click here to read the post). 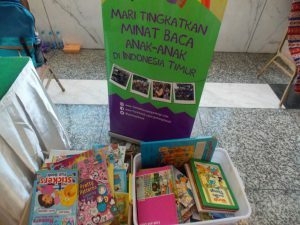 That campaign has resulted a 5,000 books donation for Taman Bacaan Pelangi!!! Thank you everyone for reading those online books that made the Pearson Publishing donated the same amount of books that you read to us! 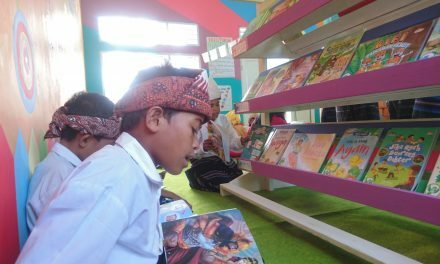 Last Saturday, September 1st, 2012, Taman Bacaan Pelangi (Rainbow Reading Gardens) dropped off the first installment of 5,000 books donated by the Pearson Publishing, Pearson Foundation and The Asia Foundation and held a handover ceremony in Melo Village, Flores, East Nusa Tenggara. President of Emerging Market from Pearson Publishing Michelle Lombard, Director of The Asia Foundation Erman Rahman, Books for Asia Program Manager Aryasanti Dewi and Senior Education Representative of Pearson Indonesia Adri Prakorso joined the fun together with our volunteers and some of the kids from Melo Village and Roe Village. The event was held in one of the Taman Bacaan Pelangi (TBP)’s locations in Flores, which was in Compang To’e Art & Cultural Center. Bapak Yoseph Ugis, our volunteer from TBP Melo Village and Bapak Avent from TBP Roe Village organized the event and it was a big success! Everyone was happy. Everyone smiled. Everyone had a lot of fun! 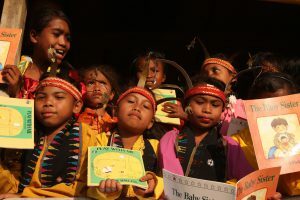 When we arrived, Bapak Yoseph and all the kids wearing traditional costume, greeted us in a traditional culture/ritual. Everybody was singing in a local language and they gave a traditional woven scarf to Michelle Lombard and Erman Rahman, then slowly walked together to the hill to continue the ceremony. 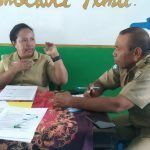 During the ceremony, Bapak Yoseph welcomed everyone and as a token of hospitality and part of the local culture, he gave Michelle a bottle of local wine and…. a white rooster! Michelle looked very surprised, but happy! 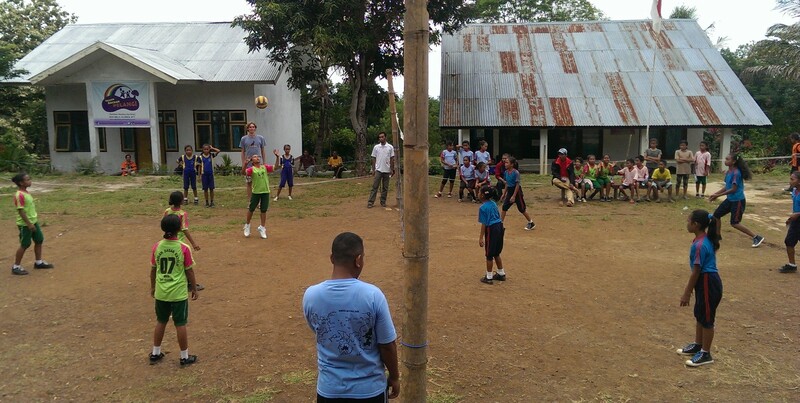 After the whole ritual and handover ceremony, the fun part began! The kids from Roe Village performed “Caci” dance (a whipped dance)! They were super cute and looked very brave!!! 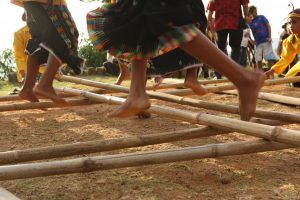 The kids from Melo Village also performed some traditional dances, such as “Tek Tek Alu” and sang a beautiful folk song while standing and walking slowly in a big circle. What a beautiful day! Michelle Lombard from Pearson Publishing said, “This is one of the most incredible days in my life!”. It was indeed an incredible day. Not only the elders that enjoyed the kids performances, the kids themselves had a great fun dancing and singing together. So many smiles, so many laughters, so many love being shared that day. On behalf of the kids at Taman Bacaan Pelangi, we thank the Pearson Publishing, Pearson Foundation and The Asia Foundation for the 5,000 books of donation via the “We Give Books” campaign and the “Books for Asia” program. We hope this was the first step of a long term partnership between the three institutions. Happy International Literacy Day, everyone! PreviousThank You, The Jakarta Globe!